Smoked salmon sandwiches are refined, delicate and can satisfy just about anyone’s palette. Perfect for parties, tea or a light and refreshing lunch, these sandwiches are easy to make, but feature flavor and style that makes them look like a labor of love. If you want to impress your guests, or simply enjoy a tasty treat, whip up these smoked salmon sandwiches and enjoy. 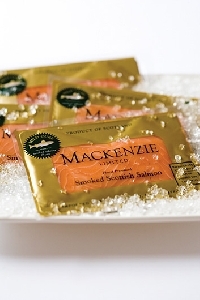 The most important aspect of making smoked salmon sandwiches is making sure you are using fresh, high-quality ingredients. Since the smoked salmon is the star of the show, it needs to be perfect. Only buy it from a reputable vendor and make sure it smells good. Additionally, use gourmet bread and make sure the rest of your ingredients are super fresh. Paying attention to the quality of your ingredients makes a big difference in the finished product. You can’t just slap salmon on the bread and call it day; you need something flavorful to coat the bread with, so make a yummy butter spread to accompany your salmon. Do so by placing 2-½ lbs. of room temperature, unsalted butter into a large mixing bowl. Add 5 tbsp. each of dill, scallions and flat-leaf parsley to the butter, along with 5 tsp. of lemon juice and kosher salt. Add 1-¼ tsp. of minced garlic and black pepper. Mix the ingredients together in your mixer, then set aside. You could also substitute your favorite herbs in place of those featured. Or, mix mayonnaise and horseradish together for a zesty accompaniment to the smoked salmon. Using high-quality bread is super important, as it makes up a majority of the sandwich. Five-grain bread that is unsliced is delicious with the smoked salmon; however, you can use any bread you like. However, cut them to about ¼-inch thick, or ask someone who works in your local deli to do so with the bread slicer. Spread the butter or mayonnaise mixture on the bread slices with a butter knife or icing spatula. Place a slice of smoked salmon on half of the bread slices, then top each with another slice of bread until you have created all the sandwiches. Place all of the sandwiches on a tray. Wrap it and place it in the fridge until the butter is cold. Use a sharp knife to cut off the crusts, then cut each sandwich crosswise, then diagonally until you have 40 small triangles. The sandwiches should be served cold; therefore, do not set them out until you are ready to eat them. The recipe makes 40 sandwiches, but can be easily divided to make fewer sandwiches. These smoked salmon sandwiches will be the star of any party, or the perfect accompaniment to a quiet night in.